Lowering kit for the new 2019 Suzuki Katana 1000. Lowers the rear suspension and the seat height by replacing the standard suspension linkage brackets with new ones made in roll-forged steel by Lust Racing. Excellent modification for shorter riders who find the Katana 1000 to tall to reach down to the ground with both feet. The LUST Racing lowering kit lowers the rear suspension by 1.6"inches (40mm). The suspension lowering brackets by Lust Racing are stronger than the standard parts replaced and are engineered to last the lifetime of your bike. 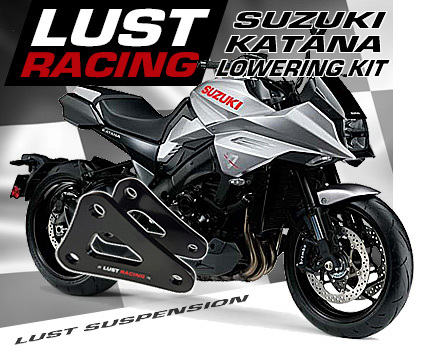 The Suzuki Katana 1000 lowering kit is supplied with installation instructions. Will fit Suzuki Katana1000 from year model 2019 onward.